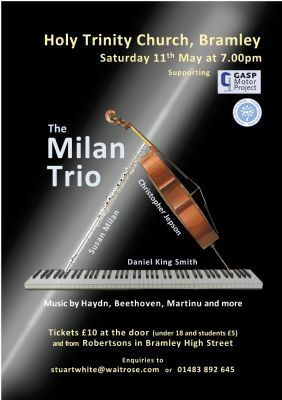 We shall welcome the Milan Trio, namely acclaimed flautist Susan Milan, ‘cellist Christopher Jepson and pianist Daniel King Smith. The Harlequin Chamber Choir will be making a welcome return, with an inspiring and entertaining blend of choral music for your enjoyment. For our 2019 Celebrity Concert we shall be joined by world famous clarinettist Emma Johnson! She will be joined by young pianist Gregory Drott, and it is likely that the music will range from classical to jazz with something for everyone! We are likely to hold another of our very popular ‘home grown’ concerts featuring several local and honorary local musicians. If you wish to be added to the Bramley Music mailing list for news of future concerts please let Stuart know.